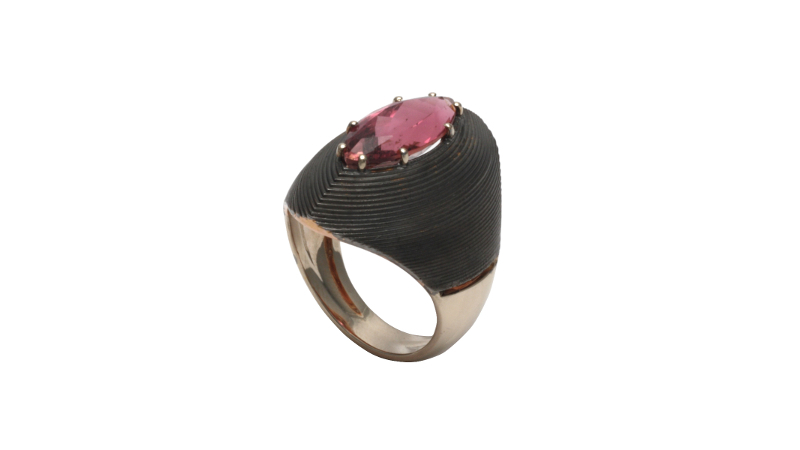 EXCALIBUR 18k rose gold with black rhodium plating, white natural gold ring, pink tourmaline In this collection the design is dominated by parabola and oval forms, and the characteristics of 3D laser processing are stressed. Geometries and combination of definite shapes and colours give to the jewels an exciting aura of soft dark charme. 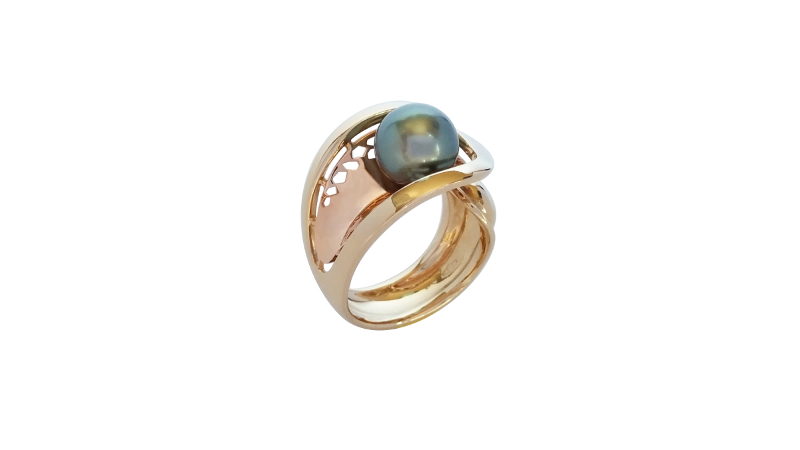 LUCREZIA 18k rose gold with black rhodium plating, white natural gold ring, white diamond In LUCREZIA project, the circle is prevalent, grows or decreases and may become a little bon-bon, delight of tiny and refined details in its aesthetic as in its construction. The black rhodium on red gold gives a nineteenth-century delicate fragrance to a collection which is actually extremely contemporary. NIDO 18k natural white and rose gold ring, Tahiti black pearl The egg, shape and geometric figure with multiple meanings and symbolisms (think of the famous example of the “Pala di Brera” by Piero della Francesca) is at the origin of the design process of this collection, and as a closed circle, the shaped material recaptures the form of a cozy nest, majesticy alcove for the beautiful Tahitian pearl. The historical honeycomb open-work (called opus interassile in Roman age and in more recent times tulle, see remarkable examples in Buccellati jewels) is here interpreted in a macro version. and design”, curated by Alba Cappellieri (2008-2009)The inspiration for this collection are the soft and caressing lines of the sea waves. 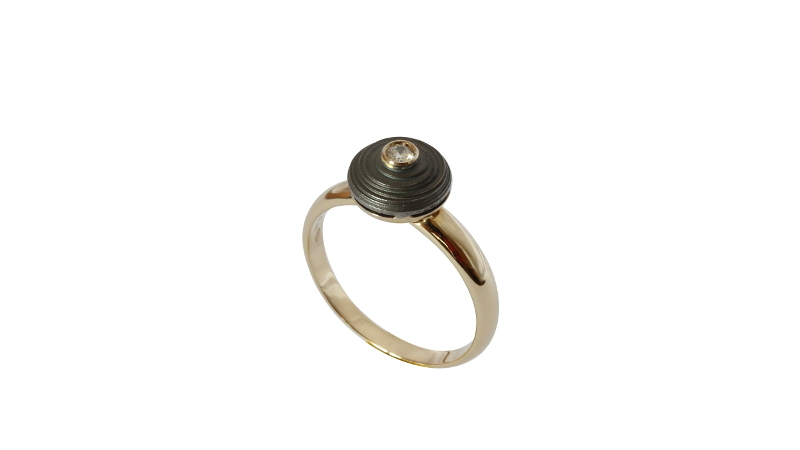 The design of this ring refers to quality such as sinuosity, movement, fluidity, the ring has been shaped by the use of 3D software. It is also a versatile project, nearly modular, as it can be set up for one, two or three stones, which may be different in cut and shapes, or for pearls. 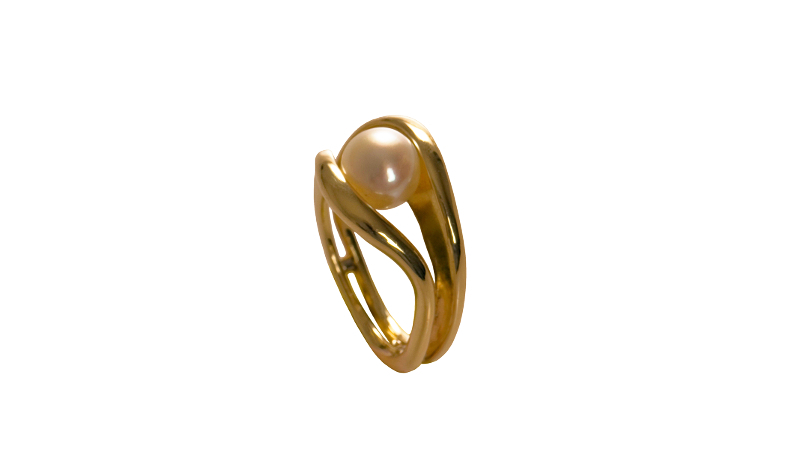 ONDE 18k yellow gold ring, pearl The inspiration for this collection are the soft and caressing lines of the sea waves. 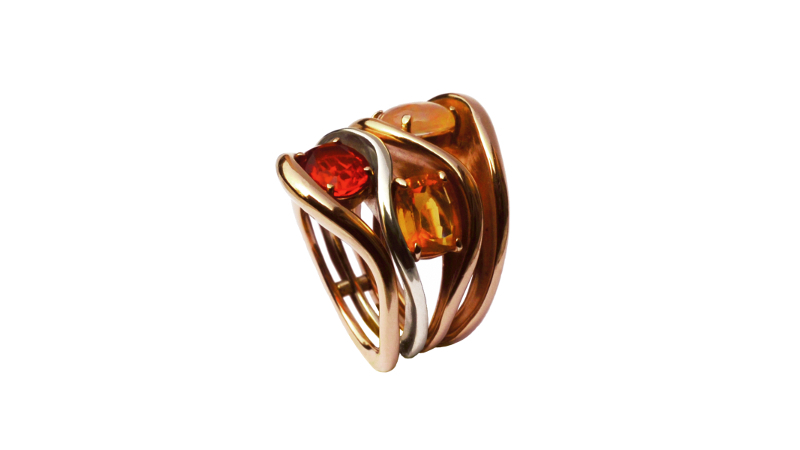 The design of this ring refers to quality such as sinuosity, movement, fluidity, the ring has been shaped by the use of 3D software. 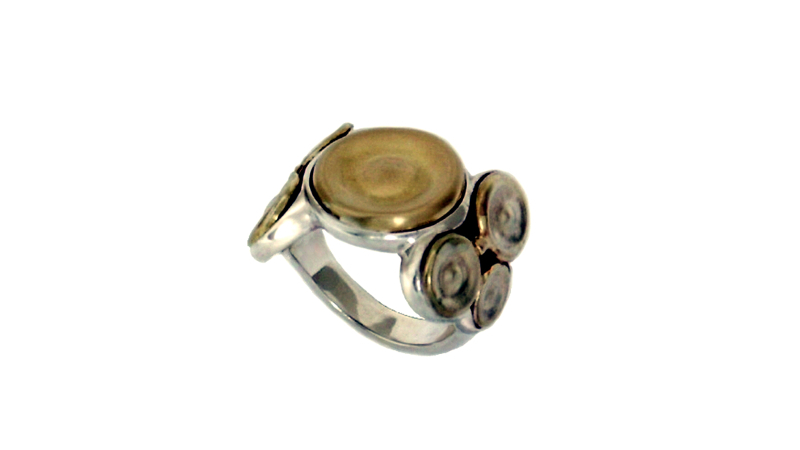 MINERVA Sterling Silver, 18k yellow gold and oxidized brass ring In MINERVA the combination of circular modules of different diameters is the leitmotiv, the oxidation chromatism by dissolved silver as a gouache on the surface of the brass studs gives the collection either unicity (each element is individually treated and the spots follow the fire phantasy) and an archaic bewitching expressiveness. ANELLO per MILANO Sterling Silver and 18k black Rhodium yellow gold ring Shown at the exhibition “Jewels for Milan”, curated by Alba Cappellieri (2011) Photo by Dario Sigona, editing by Laura Poletti.©LabFoto INDACO/Politecnico of Milan. For creating a jewel for the city of Milan I wanted to search inspiration in some concept, not involving religious or political implications. During the research for this project, I noticed an aerial photo of the churchyard of Milan cathedral, open space in every sense and heart of the city, and this corresponded to the principles I wanted to express. The arrangement of white and black marbles created a play of square and modular lights, which I was interested to reorganize and to liven up. The visual connection of this pattern with QRcode was immediate, so I have chosen to adopt this new way of communication code and transfer it into the project. 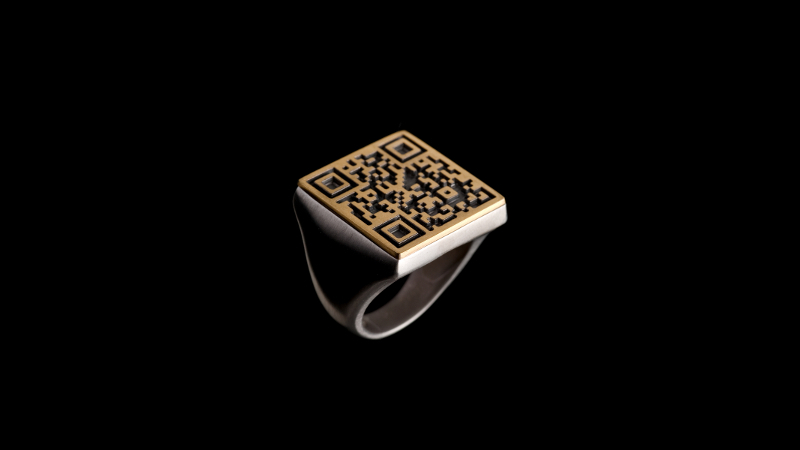 The QR code on a square plate in yellow black and brushed rhodium gold is generated by a bas-relief, thus acquiring the function both of image and of “seal ring”. Focusing the ring table in the camera of any smartphone equipped with a QRcode reader app, you’ll see the link to the portal of the city of Milan. 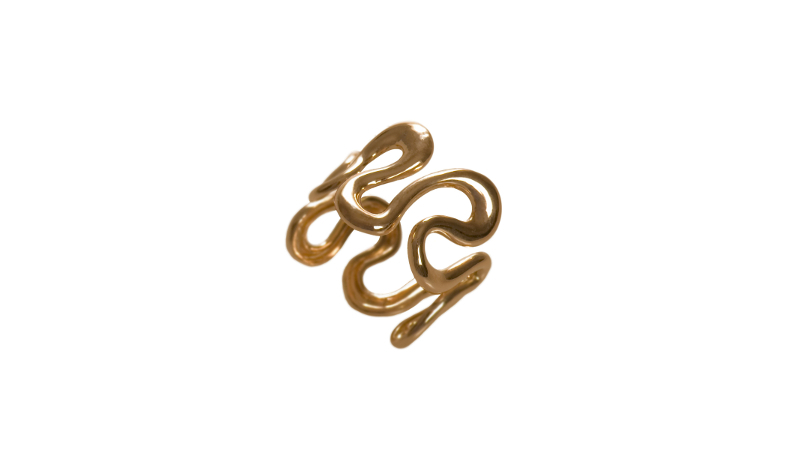 SNAKE 18k rose gold ring Its main feature is either a continuous shape – free from the beginning to the end –and a different roundness of each sinusoid and of each section curve which – like every moment of our life – is never equal to itself.